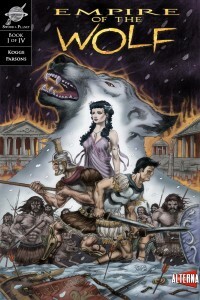 The graphic novel compilation of the four issue series was created and written by Michael Kogge, with art by Dan Parsons (Game of Thrones and over 100 Star Wars comics) and David Rabbitte (Star Wars Insider), coloring by both Chris Summers (Spartacus: Blood & Sand) and David Rabbitte, lettering by Marshall Dillion (Street Fighter, Game of Thrones, and Green Hornet), and the cover painting by renown fantasy illustrator Doug Beekman (Wizard’s First Rule). Empire is available either in print as a graphic novel or on comiXology as individual issues. Printed promotional issues are available at any convention the Sword & Planet Studios team attends. Michael Kogge (writer): Author and screenwriter Michael Kogge has written for many clients, including Disney, Activision/Blizzard, Lucasfilm, Topps, and Titan Publishing. Most recently, he’s penned the Star Wars Rebels series of books based on the hit animated series. He also writes a monthly feature for the official Star Wars Insider magazine. He can be found online at michaelkogge.com. Dan Parsons (pencils – issues 1 and 2): Dan Parsons has worked in comics for over 20 years, starting with his original series Savage Planet and Harpy, and graduating to be the lead inker on Dark Horse‘s Star Wars comics. He has inked more than 100 titles, most recently Star Wars: Dawn of the Jedi and the new classic Star Wars series. He also completed production art for the HBO hit series, Game of Thrones, which can be viewed on the Bluray set. Like his facebook fan page. David Rabbitte (pencils – issues 3 and 4, colors – issues 1 and 4): David Rabbitte is a professional illustrator who has worked in the animation industry since 1993, serving as a background artist on feature films such as Anastasia, Titan A.E., and Curious George. As a freelance artist, he is best known for his sci-fi and fantasy art, which has been featured on book covers, magazines, trading cards, and comics from Lucasfilm, 20th Century Fox, Universal, Marvel, Boom! Studios, Decipher, Topps, and Upper Deck. Some of Rabbitte’s notable recent projects include illustration work for Star Wars Insider short fiction and art for National Geographic’s children’s book That’s Creepy. He resides digitally at davidrabbitte.com. 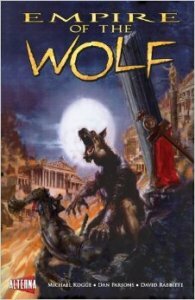 Chris Summers (colors – issues 2 and 4): In addition to Empire of the Wolf, Chris Summer’s professional comic work includes titles including G.I. Joe, Dungeons & Dragons, Superman, Nightwing, The Perhapanauts, and Spartacus: Blood & Sand. He is a regular guest lecturer at Hardin-Simmons University. He also keeps busy doing design work such as vehicle wraps, band merchandise, tattoos, guitars, video game concept work and much more. Find him at chrissummersart.wix.com/chrissummersart. Marshall Dillon (letters): Marshall Dillon has worked in the comic industry since 1994, serving as Managing Editor for Devil’s Due Publishing, BOOM! Studios, Speakeasy Comics, Ice Kunion, and Udon Comics. Since 2006, he has lettered many comics and mangas for a variety of clients that range from Image Comics and Intel to BBC Scotland and the United States Armed Forces. His maintains a web presence at marshall-dillon.squarespace.com. Doug Beekman (cover, graphic novel): Doug Beekman is one of the most renown fantasy illustrators of our time, having painted the covers to bestsellers like Terry Goodkind’s Wizard’s First Rule and Piers Anthony’s The Source of Magic, along with many other distinguished sword and sorcery titles. Check out his art at Comic Art Fans.